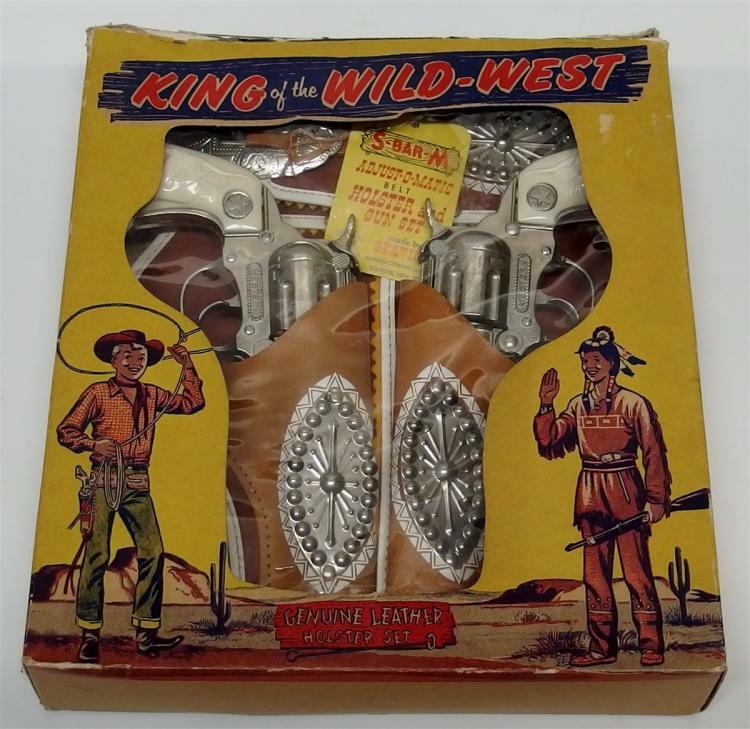 This auction is the first session of a 40 Year collection of Cowboy & Western Toys, Comics & Collectibles. Roy Rogers, Tom Mix, Hopalong Cassidy, Lone Ranger & others. Includes cap guns, holsters & rifles, comics, lunchboxes, hats, guitars, pinbacks, stagecoaches, etc. All sales final. All items sold as is. Accepting cash, check, major credit cards, paypal and wire transfer. We only accept American Express for US bidders. There is a 18% Buyers Premium. Add/Delete rights reserved. All items must be paid for upon receipt of invoice. Auctioneer may refuse any bid or bid increment deemed inappropriate. Phone and absentee bids accepted. 1. All property for sale is sold AS-IS with no guarantee whatsoever, and all sales are final. We have made every attempt to catalog each item as accurately as possible. We encourage prospective buyers to inspect each item personally and review all photos to make their own judgment. We will absolutely not accept any returns for any cause whatsoever. 3. Absentee, phone or online bidders will receive invoices within 24-48 hours after the auctions closes. Complete payment is required upon receipt of the invoice. Items must be paid for no later than three (3) days following receipt of the auction invoice. After that time, the sale will be deemed null and void. 4. Paid items must be removed from the auction gallery. Please note that online purchasers who wish to pick up their items shall not do so until the Tuesday following the day of auction, so that our staff has adequate time to process the transactions. After ten (10) days, any paid items remaining at the auction center will be placed in storage. Fee for storage will be $10 per week per item. 5. We will ship small items purchased by online, absentee or telephone bidding at the high bidder's request. Most packing, shipping and insurance are handled by Seymour Auctions. To economize, they will pack multiple items of similar size and type together if possible. Smalls will be shipped USPS Priority Mail with insurance. All large items will be shipped UPS-ground of FedEx with insurance. All items must be insured. A nominal fee of $5 per box is added for packaging and handling, slightly more for large orders or multiple items. Questions regarding shipping costs, insurance and tracking should be directed to patty@seymourauctions.com. We ship within 3 days of payment. Buyers of large freight (i.e. furniture) will be outsourced to your preferred shipper. Please have your shipper contact us to coordinate the pickup time. All shipping charges are the responsibility of the high bidder. 6. The highest bidder shall be the buyer and if any dispute arises between two or more bidders, the auctioneer will decide the buyer. The auctioneer's decision will be binding and final. 7. The record of sale, kept by the auctioneer and clerk, will be taken as absolute and final in all disputes. 8. Some lots may be offered subject to a reserve. A reserve is a confidential minimum price below which such a lot will not be sold. 9. Seymour Auctions will not be held responsible for error or failure to execute bid(s). Absentee bids must be in writing and a fifty-dollar minimum bid is required per item. Phone bidding is an available service and must be arranged in advance with our staff. We suggest that phone bid arrangements be made 24 hours before the start of the auction in order to ensure adequate processing time. 10. The deadline for phone or email inquiries is 8 pm EST the day before the scheduled auction. Please address email inquiries to patty@seymourauctions.com. 11. Purchasers may inspect the merchandise and are urged to do so. The Auctioneer makes no warranty as to condition and shall not be responsible for any defects in any Lot. All goods are exposed for Public Exhibition and, for Internet buyers condition is described in the listings. Item descriptions, dimensions and estimates are provided for guidance. It is the buyer's responsibility to inspect all lots prior to bidding to ensure that the condition is to their satisfaction. If potential buyers are unable to inspect lots in person, our staff will be happy to provide a verbal condition reports by phone on individual lots. These are for guidance only, and all lots will be sold as described, as per our Terms and Conditions of Sale. All goods are sold "AS IS" and "WITHOUT RECOURSE". 12. We have tried to describe each lot as accurately as possible, and we have included descriptive photographs as well. However, we are selling each lot "as is" and there will be no returns allowed if you are not satisfied with condition. Please satisfy yourself as to the condition of the item before bidding. Please ask all questions prior to bidding. 13.We are not responsible for color discrepancies due to photo reproductions or computer variations. 14. Internet bidding is offered as a service to the bidder and bidder understands that this service may or may not function correctly the day of the auction. Under no circumstances shall the bidder have any claim against Seymour Auctions or anyone else if the Internet service fails to work correctly before or during the live auction. Should internet bidding fail for any reason, please contact 843-554-5005, to enact an absentee or telephone bid. We will do our best to accommodate you at the auction. 15. Your bidding at this Auction indicates that you have read and accept these Terms & Conditions of Sale. We accept credit cards for payment for any US winning online bidders at all sales. We require credit card information to bid. Prompt payment is required, bidder cards may be notified notified and credit card charged 4 days after an invoice has been sent. Invoices will be emailed 24-48 hrs after the auction. Buyers can also pay for the items at the scheduled pickup time. Pickup is available after Tuesday 10am-7pm at the gallery. Bidders must have a paid receipt to pickup their items or be prepared to pay at pickup time. Please bring help to load items. Out-of-state winning bidders must contact us to coordinate other pickup times. We will gladly work with your shipping company. We will ship items purchased by online, absentee or telephone bidding at the high bidder's request. Most packing, shipping and insurance are handled by Seymour Auctions. To economize we will pack multiple items of similar size and type together if possible. Smalls will be shipped USPS Priority Mail with insurance (Flat rate will be used when appropriate). All large items will be shipped UPS-ground or FedEx with insurance. All items must be insured and a nominal fee of $5-10 per box is added for packaging and handling. For international shipping, please call for a quote. Questions regarding shipping costs, insurance and tracking should be directed to patty@seymourauctions.com. We ship within 3 days of payment. Buyers of large freight (i.e. furniture) will be outsourced to your preferred shipper. Please have your shipper contact us to coordinate the pickup time. All shipping charges are the responsibility of the high bidder. Please see note under payment regarding shipping charges and billing. We have made every attempt to catalog each item as accurately as possible; Purchasers may inspect the merchandise and are urged to do so. The auctioneer makes no warranty as to condition and shall not be responsible for any defects in any lot. All goods are exposed for public inspection. Item descriptions, dimensions and estimates are provided for guidance. It is the buyer's responsibility to inspect all lots prior to bidding to ensure that the condition is to their satisfaction. If potential buyers are unable to inspect lots in person, our staff will be happy to provide a condition reports on individual lots. These are for guidance only, and all lots will be sold as described. All goods are sold "AS IS" and "WITHOUT RECOURSE". Please ask all questions prior to bidding. Lot 3: ROY ROGERS Leather Holster for Toy Cap Guns, Embossed Studded RR Logo, 31"
Lot 26: 4 Toy Indians & Horse Figures, 3" Red with chipped tan paint.